The Department of Disaster Management under Ministry of Home and Cultural Affairs has come out with a tentative overview of the disaster caused by the recent flood. Bhutan experienced one of the worst monsoons with relentless rain causing floods and landslides in many parts of the country, especially in the southern belt. The major affected districts are Sarpang, Chhukha, and Samtse. In Sarpang, around 220 people from 63 households were affected. The Sarpang River, after bursting its banks, washed away the town. Of the 63, 21 households were evacuated to temporary shelters. The remaining moved to rented apartments and some put up with their relatives. The flood also damaged 34 acres of wetland and 58 acres of dry land of which more than seven acres of land cannot even be reclaimed. Close to five acres of orange orchard and two acres of paddy field were also destroyed. The flood also damaged retaining walls, bridges and water sources. 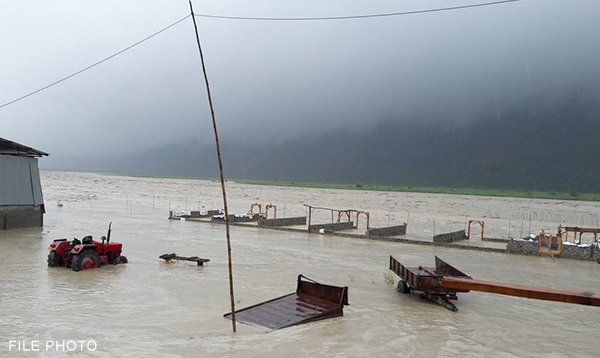 A man was washed away by the swollen Amochhu River in Phuentshogling under Chhukha. A total of 17 families were affected with three houses completely damaged. Two bailey bridges also collapsed. Some irrigation channels were also damaged. 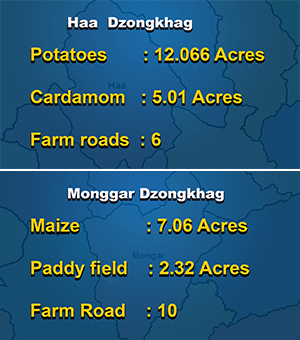 Chhukha lost two acres of paddy field, close to an acre of mandarin, 21 acres of Cardamom, more than one acre of ginger field, 196 acres of potatoes and more than three acres of paddy field to the flood. A resident also lost 15 goats and 12 cows to a landslide. In Samtse, three lost their lives: a 4-year-old girl, 11 year-old boy and a 46-year-old man. A 56-year-old woman also went missing from Ugyentse. A bailey bridge collapsed at Budhini. There were several road blocks and power supply disruption. The monsoon also damaged many houses. Although, Haa did not face major infrastructural damage, 12 acres of potatoes and five acres of cardamom and six farm roads were damaged. In Monggar, seven acres of maize and two acres of paddy field were damaged. Ten farms roads were completely damaged as well. According to an official from the Department of Hydro-Met Services, Bhutan got the heaviest rainfall in July, 2004. However, the duration of the rainfall was short as compared to this year’s, causing no major damages. The weather in the southern region has now improved. The Disaster Management team is still in the process of compiling the assessment of the overall damage. After the assessment is complete, the government will start the relocation and reconstruction.